With over 4 decades in photography, design, pre-press and printing, HutchColor offers an unmatched calibre of color management training and services to printers, ad agencies, designers, retouchers, galleries, photographers, publishers, pre-press houses - in fact anyone who needs accurate color reproduction. G7* is a revolutionary new calibration method that delivers consistent gray scale appearance on virtually any type of color imaging process. By defining neutral density, neutral contrast and gray balance unambiguously, G7 helps define the whole color space and makes 'printing by numbers’ more effective in virtually any imaging process. Proficiency in G7 has become a requirement by brands, publishers, ad agencies and print buyers who want consistent, high-quality color from diversified suppliers and media. Print providers in turn achieve more consistent and efficient color printing through G7. As the inventor of G7, HutchColor, LLC offers the most thorough and up-to-date G7 training possible through private consulting contracts and public G7 Expert/Professional courses hosted by IDEAlliance. 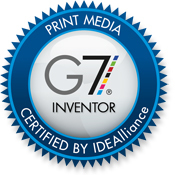 G7 users who have been trained by an IDEAlliance-certified "G7 Expert" can choose to be listed as G7 Masters at www.idealliance.org, where they can be found easily by print buyers who see G7 as a reliable indicator of color quality. Choose from the following G7 training modules, or get several in one integrated package. What is G7 and what's in it for creatives and print buyers? What can you do to help your G7 print provider give you the "look" you want? How do you know a G7 print provider is giving you what you asked for? Why retouching is best in RGB, even if your image will be printed in CMYK. What are reasonable expectations and tolerances for different types of printing? How to calibrate a proofing system by the G7 method. Using color management to match a G7-calibrated proofing system to the latest GRACoL* or SWOP* appearance specifications. How to determine if client-supplied proofs are G7-compliant. Helping suppliers and clients move to G7-based proofing. How to work with those who aren't yet using G7. Not sure if your proofs (or those you're receiving) are G7-compliant? We can test them for you, or show you how to do your own testing. Individual proof verification requires printing the 2007 IDEAlliance ISO 12647-7 Control Strip on EVERY proof, measuring the strip with an automated spectrophotometer, and comparing the measurements to a "reference" set of CIELab values in suitable software. How to calibrate a press or proofing system using the G7 methodology. Using the new G7 Press Bar with hand-held and automated devices. Printing "to the numbers" using G7 press control. Understanding the difference between make-ready and run control. Establishing reasonable tolerances between press and proof. Features and benefits of G7 press control - selling the G7 concept to your staff and clients. Making CMYK files optimized for G7 proofing and printing. Using "standard" ICC profiles for SWOP and GRACoL vs. custom in-house profiles. GCR - how much is enough? Are there any negative side-effects? Maximum black ink value, 95, 98, 100%? How to determine if supplied CMYK files are G7-ready. What to do if they are not. Standardized G7 calibration, proofing and printing are wonderful, and relatively easy, but how do you know they are working consistently in daily production? Inconsistent or unstable processes waste money and lose clients. G7 Process Control explains the theory and practice of maximizing process stability and consistency throughout your entire workflow. Training is tailored to your specific needs without forcing you to learn about stuff you won't use. Private training courses are typically 2 to 5 days, depending on content and existing skill levels. Contact Don Hutcheson for a detailed analysis of your company's needs. Services at a management or planning level include..
Benefits and limitations - how much can you save - how much should you spend? Unlike some color management companies, we do NOT offer profiling services. Instead we train you to make your own profiles from scratch using your own software and equipment (a much better use of your training dollars). Then we teach you how to use your profiles most effectively in your actual workflow, and what to do if something changes (which you can pretty much count on). All training is customized to your specific needs, so you don't pay for what you don't need. Drum vs. flat bed scanners - is there a difference? What should you buy? You wrote the killer ap - but will it sell? Unlike most consultants, we neither sell nor accept finders' fees on software or hardware. All our recommendations are based solely on merit. You can buy software or hardware from many sources, including the vendors listed on our Reviews page.